TCAV Celebrated 50 years in 2006 with the inaugural induction of 12 revered and respected coaches. These inaugural inductees have been classified as first generation professional coaches whose contributions helped to create Australia’s “golden era of tennis” and who each through their remarkable commitment to tennis coaching have pioneered and trail-blazed the way for all of us today and beyond. Over the 50 year history there will be many other coaches who will have met such criteria. Each year TCAV members past and present will have the opportunity to nominate their peers and colleagues to join our inaugural Hall of Fame inductees. A maximum of two (2) new nominees will be inducted each year. The TCAV Honour Board categories include LIFE MEMBERS, HALL OF FAME and LEGENDS. We hope that by inducting the first 12 Hall of Fame Coaches we will spark much discussion and healthy debate and begin to learn more about the wonderful achievements and contributions to the great game of tennis from our TCAV / TCV coaches. We trust that all TCV members will recognise the underlying spirit of creating these awards. Coached at more than 20 clubs with metropolitan Melbourne and many schools, including Wesley College for 33 years and Xavier. Coached, and continues to coach, at many country tennis clubs and schools, including Heathcote, Murchison, Nagambie, Tumut and at Puckapunyal Army base. With Denis Lemke conducted numerous tennis clinics at Mildura, Echuca, Wodonga and Albury. Joined the TCAQ in 1962 and upon return to Melbourne in 1964 was admitted to the PTAV on an Interstate Reciprocal Transfer. For many years the PTAV/TCAV conducted the examination of applicants on his courts in Glen Waverley. Was treasurer of the LTPAA for nearly 10 years, and also their Queensland delegate. Started playing tennis when he was 6 years old. Worked in the motor trade until 1968, when he saw an advertisement regarding the Tennis Promotion Council. After talking to Ian Occleshaw and Don Tregonning decided to become a coach. In 1969, after only being a member of the PTAV for a month or so was asked to become treasurer, which he held for 9 years and was President for 8 years. Was pleased to be involved with the development of the Code of Ethics and also in forming the National Body. Coached mainly in the South East bayside suburbs and pupils included Julie Hunt (Glen). Moved to Queensland in 1980 and remained coaching until 1995. Still plays 5 to 6 times a week. Leo was born in 1895. Originally from the land at Tongala he moved to Melbourne where he became a grocer, prior to becoming a tennis coach at the Droop St courts in Footscray. Modelling himself on the great Bill Tilden he taught himself the art of tennis. Committing himself to tennis, Leo represented Victoria in the late 20’s and began a very successful and long lasting coaching career. 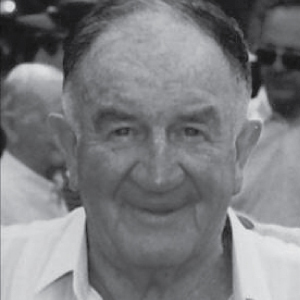 Leo coached at many schools, including Genzano, Toorak College, Sacre Coer and Mandeville and coached players such as, Nancy Bolton (Wynne), Thelma Long, Judy Tegart, Colin Long and Marie Twomey. Two of his three sons, Neil and Kevin, went on to be successful coaches in their own right. Always an innovator, in the early 30’s Leo scoured Melbourne for a roof big enough to put a court on. Finding a building in Flinders Lane the deal was that he had to rent some office space and he could have the roof for free. Above a furniture store, the office space was used for wet weather practice having a hitting wall at one end with a 3ft bullseye painted on it. The roof top court was originally asphalt, but later en-tout-cas, with a fence that was twice as high as normal. Even then, many passer-bys would look up in shock as a poorly struck ball came flying down. A TV show once did a piece on a roof top court in Sydney and how unique it was. Leo’s son Neil called up Channel 7 in Melbourne and, motivated by the Sydney/Melbourne rivalry, Channel 7’s “nightwatch” program did a piece on Australia’s “original” roof top court – which preceded the Sydney court by some twenty years. Leo coached in Flinders Lane for over 30 years before moving to a home in Caulfield with a court in the 60’s. With his sons he also set up one of Australia’s first purpose built tennis ranches on the Esplanade at Mount Martha. 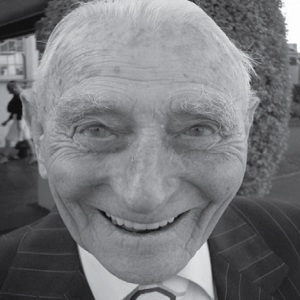 John, AJ, or Mr H as he is affectionately known, has been a passionate tennis supporter all of his life. He was born in Beringa, a small town just north of Ballarat. As a young boy he played all sports, and one day, while waiting for a bat in a local game of cricket, he decided that cricket was too slow for him and that he would turn all of his energies to tennis. Living on a farm near Colac at the time, playing Saturday afternoon tennis also enabled him to avoid milking the cows. Early on John was employed as a “useful” for Sir Isaac Isaacs at his Mt Macedon property earning 25 shillings a week plus board. There was a tennis court but John was not allowed to use it until he acquired some “whites’ which he soon did. Obtaining qualifications in the RAAF, he moved to the “big smoke’ in 1937 where he worked for a number of large corporations before becoming a professional tennis coach – he had been teaching local kids for nothing up until then. John has run a very successful coaching business since 1952 in Park Street Moonee Ponds, which he termed “looney Ponds”. Over the years he also managed many weekly teams, sometimes entering as many as 23 teams in day and night competitions. John was always getting engrossed with the lessons and his wife, Monica, could often be heard shouting out from the house that the next lesson should be starting. Some of his students are Owen Davidson, Kerry Harris, Wanaro N’Godrella and Janette Bergman. John also spent time coaching in New Caledonia. 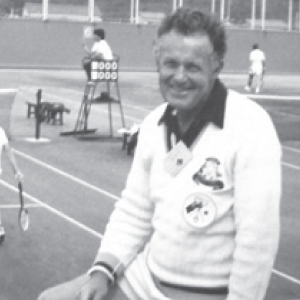 John managed to find time to also be a professional umpire (VLTUA Davis Cup Umpire) for many years and, because of his tennis expertise, he was also selected to go around and test the use of en-tout-cas as a court surface .He wrote many articles for papers and magazines under the by-line ’one of the roving kind’. He has been married to Monica, who turned 100 in August, for 67 years and they have two children – Veronica and John junior. He was President of the PTAA for 7 years and the 3rd vice president of TCAV. During 1967, Bill started coaching privately at Bentleigh and Noble Park. He was encouraged by parents of pupils to consider a career in tennis coaching. He was presented with his LTAV Certificate of Efficiency in 1969 – the registration fee was $1.05, a worthy sum for the autograph of one Harry Hopman. During 1970, he became a member of PTAV and conducted regional coaching at Warragul, Yallourn and Morwell. Bill was known for his efficient and effective work with children and adults alike and was recognised as a hard but fair taskmaster. The PTAV became the TCAV and Bill was elected a Board member in 1973 which he held for 7 years. He served as Treasurer and managed the TCAV Masters Tennis Tournament. He was also a member of the testing panel. As treasurer he recommended the annual subs be increased from $12.00 to $60.00 which, whilst not popular, ensured the Association established a sound financial base. 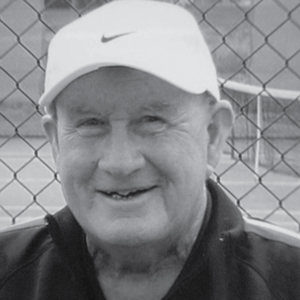 Bill coached at Dandenong and East Malvern for many years prior to moving to Berwick, where he founded the Berwick and District Tennis Association in 1984. He was President for 11 years and was acknowledged with Life membership. He was the Tournament manager at Lauriston for 20 years from 1973 and the tournament manager at Beaconsfield, where he was also awarded Life Membership, for 12 years. Bill was President of the West Gippsland Tennis Association (1980 – 1983) and in 1989 founded the Gloucester Tennis Club where he has been the Secretary/Treasurer for the past 17 years. started playing at age 2 in 1930. Was coached by Harry Hopman and was a member of Harry’s squads with such greats as Frank Sedgman and Merve Rose. played “A” grade tennis for many years and is the father of another State Grade player (Matthew) and grandson (James, who is now trying to make it on the circuit) making the Lemke’s the only family with three generations of State Grade players (with another grandson, Nathan 12, on the way!). played Linton Cup and the Australian Championships. won the Vic hardcourt junior singles title. was a ranked world veterans player and periodically traveled in Europe playing veterans events. was awarded a University Blue for Tennis (Melbourne Uni, where he obtained a Bachelor of Commerce). Coached for about 40 years full time 7 days a week, was one of the first full- time professional tennis coaches in Australia, starting out full- time in 1962 when no-one thought it possible to make a living out of tennis coaching. With Norm Cahill, started and ran the first Tennis Camp in Australia at Corryong in the Snowy Mountains, with many camps held subsequently. Helped form clubs : Koonung Park TC and North Box Hill TC – coached there and also was President and committee member of those clubs. coached for many years at schools and uni’s : La Trobe Uni, Ivanhoe Grammar, North Blackburn High School. 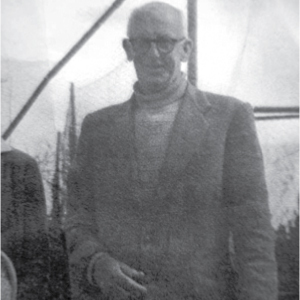 Was the first coach at the Box Hill Aquatic Centre and helped establish the tennis courts and programme there. Conducted many country clinics, including Benalla, Wodonga, Albury, Mildura, Yarrawonga, Gippsland. Ran many tournaments for pupils and others in the eastern metropolitan area. Denis met Roger Federer at Roland Garros this year when his grandson James, who was playing in the juniors, hit with Roger for an hour. Tony Roche had arranged for Federer to hit with James on court 4 in front of a big crowd and this was a life-highlight – being the ultimate coaching session. 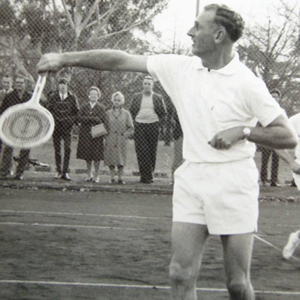 Ian played pennant for Lauriston and Glen Iris Tennis Clubs. He was a member of the Linton Cup team in 1947. 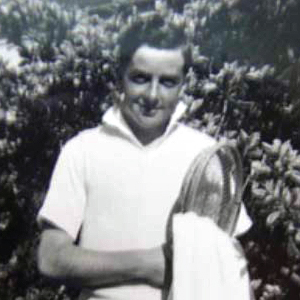 Ian played in the Australian Championships in 1950 and Wimbledon Qualifying in 1950. Ian commenced coaching in 1951. He owned four courts in West Coburg and was the coach at Glen Iris for 30 years. 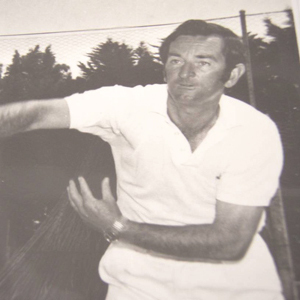 He was the resident pro, with Don Tregonning, at Kooyong for over 20 years and was the school coach at Corowa for 35 years and St Catherines for 30 years. Ian managed many Wilson and Linton Cup teams. He conducted Glen Iris’ Junior Tournament for 30 years, the Victorian schoolboys/schoolgirls tounaments for 8 years, and the TCAV juniors for 7 years. Ian conducted solidarity clinics in Brunei and Fiji and coached in the USA. Ian coached Peter McNamara (world high ranking of 7), and Alan Stone. He was a member T.A. Development Board for 8 years and a VTA State Selector for 20 years. Ian has had two stints as TCAV President and was the first secretary in 1956. He has been a board member for over 50 years, until 2004. In 2008 Ian becomes the first ever TCAV Legend. 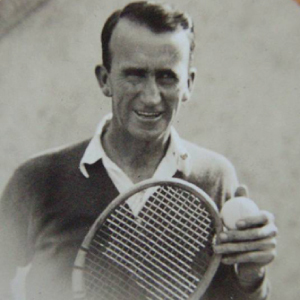 Bryan took up tennis in his teens and, after returning from the war in 1946, was asked by the man who had coached him as a teenager, Leo Guiney, to coach his classes whilst he was in Adelaide for a fortnight. Leo, upon his return, asked if Bryan would like to stay on – which he did for two years before setting out on his own. 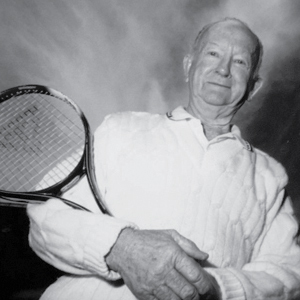 Two of his protégés, Neale Fraser and Ashley Cooper won Wimbledon – in 1958 and in 1960. Another, Judy Dalton, was runner up to Billie Jean King. Neale Fraser was 12 when Bryan took him under his wing. Yet Bryan had never been to the Wimbledon Championship until 1995 – when he was 80, having listened in the early years via the radio. Asked at the time his opinion of the modern game he said he’d like to see a return to smaller racquet heads – to make it a little less pacy. In a 50 year career, one of his favourite sayings was that he’d rather have a trier who works hard to make the grade, even if he’s not a champion, than someone with potential who squanders it. Keith originally worked at Dunlop and as a youngster played basketball with Frank Sedgman. At the suggestion of Frank, Keith became coach at Grace Park in 1958. He also coached at courts in Balwyn Road. He later moved to Ringwood Tennis Club, and owned two courts in Croydon. Keith missed out on Linton Cup selection because he was 6 days too old and turned professional in 1955. He played A grade basketball, VFL reserves for North Melbourne, was a semi finalist in the Australian badminton championships and won a state boxing title. As Margaret Smith (Court) recounts in her book, she, and her first coach Wally Rutter, came to Melbourne in 1959 after many unsuccessful attempts at establishing herself in NSW. After being approached in his city gymnasium, Frank Sedgman said ”bring her down and I will get somebody to look at her”. That somebody was Keith Rogers. After playing an ‘exhibition match’ in front of Keith and Albert Muhlhauser, they concluded that Margaret had shown little except an earnest desire to hit the ball as hard as she could and although they thought she was gawky, clumsy and raw, they agreed that she might just have something. Frank Sedgman gave her a job, Keith became her coach and the rest is history. Each morning Keith and Margaret would go running around the parks near Grace Park and often played a training game called ‘picking up daisies’. Keith and Margaret would start at one end of the park and sprint 200 yards to the other end, bending first to the right then to the left, picking the flowers along the way. Keith explained that this would make Margaret supple and help build her into a strong girl. After one pennant loss Keith told Margaret that she had not shown him the ability to fight back after being down and years later whenever she was trailing she would remember his words ‘ you must learn to fight to the last ball’. Keith always involved everyone, including, schizophrenics, convicts and out-casts – a reflection of his wonderful spirit. Keith was present at the initial meeting of PTAV held at Kooyong in 1956 and was the associations second Vice President. 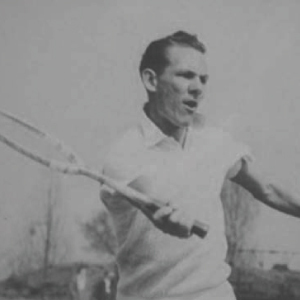 Don played at Wimbledon in 1951 and 1952, with direct entry. Played Australian Championships and various State titles. Commenced coaching in England in 1953. Appointed Denmark National Coach and coached the Danish Davis Cup team in 1955. 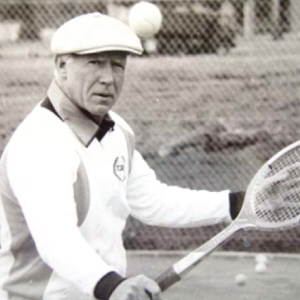 Coached Kurt Nielsen (Wimbledon finalist 1955). Started coaching at Fawkner park in 1956. Attended initial meetings to form coaches association in 1956. Coached Australian Junior Champions Cliff Letcher and Greg Whitecross and Australian Junior Finalists Bill Durham, Trevor Little, Elizabeth Little and Sally Irvine. Coached at Kooyong in partnership with Ian Occleshaw. Coached various Linton Cup and Shell Squad country squads and Australian Junior Squads. Coached squads from the Phillipines, China, and Japan and with Ian Occleshaw assisted Harry Hopman with a number of American tennis camps. Coached in Japan with leading juniors over 30 years and in 1971 helped Japan to an upset 3-2 victory over Australia in the Davis Cup. Wishes the association the best for the next 50 years. Tony Ryan writes that he started with ‘Wood’ aged 12 at the Merrivale Club Courts in Glen Iris along with Jenny Staley Hoad, Bev Malcolm Woods, Val Finlayson (mother of the Minter girls) plus John Stewart (later on an A Grade Pennant winner at Glen Iris with Alan Rae and Will Coghlan, John Brown and Jack Noseda. Most of the above played at junior interstate pennant level except Jenny who had Australian & Victorian Championship successes. ‘Wood’ (who only wore sandshoes)’ drove Jenny, Bev, John and me in his old sports car to country tournaments around Victoria and taught us all the basics of tennis and how to plan and play the game. He was passionate about tennis, spoke 5 languages, read copiously and hated TV. He entered his juniors in Senior Southern Districts competitions and favoured his students hitting together (4 to a court) cross court and down the line rather than himself feeding balls to us. Wood also relocated the Coghlan family from Warrnambool to his home in Ashburton and developed Lorraine and Will to become Australian Junior Champions and to play at Wimbledon. Thanks for the opportunity to reflect about a unique individual who coached many many outstanding Australian players.